Unsigned bands are great. There is nothing more exciting than a bunch of fresh faces on the scene. New people to look up to, new music, and that “try us out!” attitude that is yet untarnished by the wear and tear of touring, recording, marketing, and expectation that inevitably grips the hearts of many musicians. I get dozens of messages every day from new bands hoping to get some free promotion. I’ll be honest (and I think I speak for most entertainment professionals when I say it) I don’t have to time to listen to every group that comes through my inbox, DMs, PMs, or @replies. It’s just not realistic. Instead, I like to work with a handful of great management teams on a small scale. Passionate folks with promising rosters. 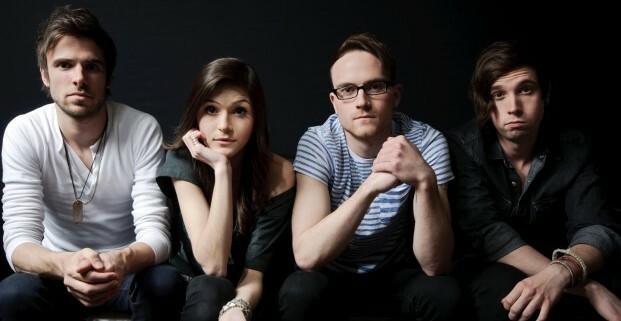 It’s through connections to a management/PR firm in Canada that I happened upon Crystalyne, a female fronted powerhouse of power-pop awesomeness. About a month or so ago, I was browsing YouTube looking for God-knows what when I happened upon this cover of a girl and a guy covering “Wasting Time” by Four Year Strong. I was hooked. Not only was the girl (who I learned to be named Marissa) attractive, but damn could she could sing. I set out to do a little research and found out that she had a band for a spell called Good & Broken which released an EP in 2009. That led me to her latest project, Crystalyne from Toronto, Canada. Due to my mobile status at the time, I had to abandon my music discovery session for other activities, but it wasn’t long before Crystalyne found it’s way back to my attention. What we have for you today is the Navigate EP, a collection of 6 songs that casts out lines (with big infectious hooks on the end no less) that reel you in with super powerful vocals provided by Ms. Marissa Dattoli. To most listeners, and due to the limited amount of female vocalists in a male-dominated alt-rock scene, Crystalyne is sure to be pigeonholed with acts such as Paramore or VersaEmerge. That said, I think the alternative music scene can’t help to make room for Crystalyne. They’ve got something really special that I think a lot of their new fans are going to connect to. On the EP, there are some BIG tracks, like the album’s two singles “Wolves” and “Weapon,” that kick off the EP with a jumpstart that are followed by some softer songs like the subtle, sweeping title track “Navigate” that brings the EP to a solid close. The production is absolutely top-notch and the instrumentals are innovative and engaging. For a debut, this release is pretty damn impressive. That is why we are proud to be a small vehicle on the path to Crystalyne’s success by premiering their work and we hope you enjoy the Navigate EP, right here on UTG. See them live on tour (Canada Only) at these dates. Love this band, It’s been so happy to work with them.